Weddings, birthday parties, cocktail parties any type of party, we can bartend and service and now cater it all. 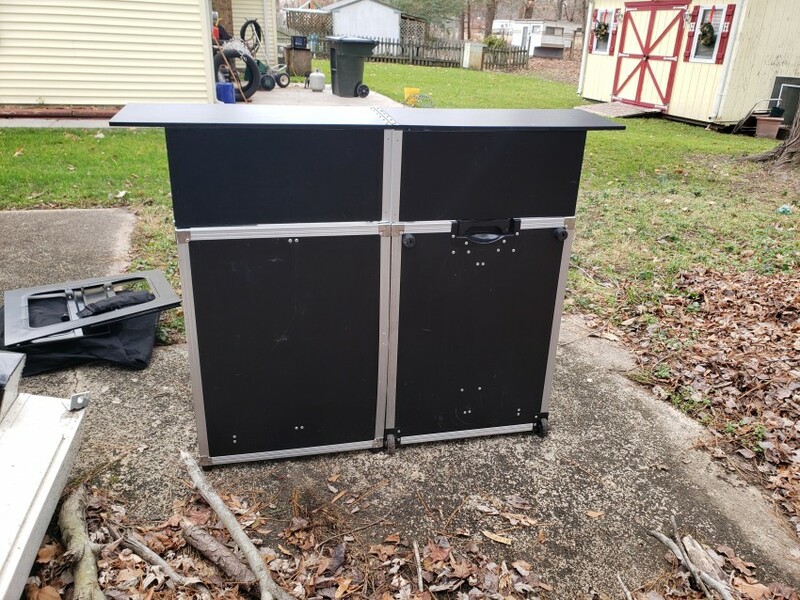 We are a mobile bartending, catering and wait staff service that will travel to you. Contact us for your next event making it the “Main Event”. With over 20 years of combined bartending and serving experience we mix and serve both alcoholic and nonalcoholic beverages and serve plated or buffet style settings. With our catering, we offer many different cuisines for every type of eating style. We can come up with a specialized menu for you upon inquiring. We had booked and paid for 2 staff and assumed that meant 2 adults, so we were very surprised when an adult and young child showed up. Had we known that, we would not have booked. That being said, we all made the best of it and they were helpful, but as a party host, it was a bit embarrassing to have a 6th grader waiting on and servicing our guests. I do apologize that you feel that way as most my staff is of the middle school, high school and early college age but with that being said because we are local we could have easily replaced her had you expressed your concern with her being there once we arrived. Further more you did hire us to wait on your guest and not bartend which I do charge a different price for so again I see why there would have been an issue with my 6th grader because she cannot serve alcohol and again I reiterate had we known this she most definitely would not have come as the younger children are not allowed in bar settings. I would love to do business with you and your family again so in the future we would just need to iron out all that you would require from us as a waitstaff. This would include a specification of the age requirement for your. Thank you again for your business and your review. Happy New Year!!! It was great having them as our bartender! Victoria provided bar service for our wedding last weekend and the service was great! Victoria was amazing! We couldn't have asked for better service. We would definitely use her again! Victoria and her husband did a great job for my wedding. Communications leading up to the event to finalize details were professional and she promptly replied. During the event, they were great, fast and friendly to guests. Our bartender Renisha Boyd agreed to come out to the middle of no where Suffolk to tend bar for our son's wedding rehearsal dinner and she handle the entire situation with a smile and a positive attitude! She asked a few questions concerning what we wanted and then she was off on her own handling everything herself. She was fantastic!! 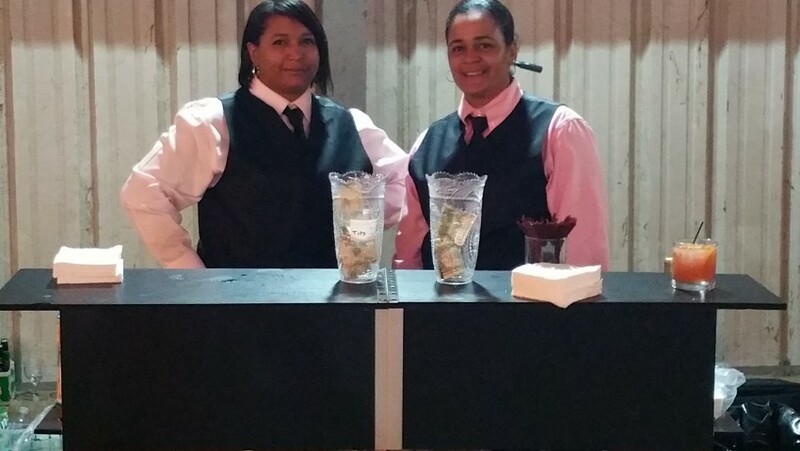 Our team from Main Event Mobile Bartending was professional, courteous and helpful! They were attentive to our needs and took care of everything! We would highly recommend them to others and would use them again! They were amazing! I highly recommend them for any event. If you're looking for the best team with the a great rate you've found them. They were punctual, professional and a pleasure to work with. I'd definitely use them again! We hired Main Event for our wedding and they did an incredible job. They did everything from helping with setup, service, clean up, and takedown. They were extremely professional and even kept track of all our rented items (dishes, etc). They needed minimal instruction and knew exactly what they were doing. They were also very flexible as we had to suddenly move indoors for the reception. I would strongly recommend them for any event. They are experienced, genuinely friendly, and great at what they do. It was a pleasure to service your wedding. Everyone was extremely nice and helpful which makes our job not feel like work at all. Thank you for your business and the awesome review. I was so impressed with Main Even Mobile Bartending LLC! 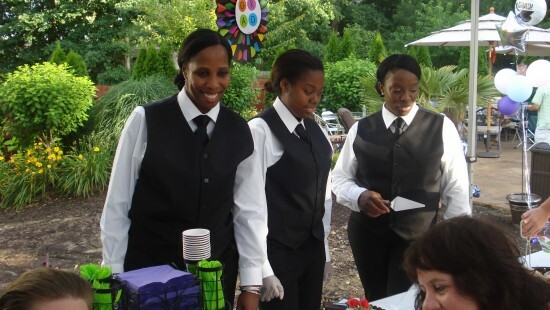 I hired them as a professional serving staff for my wedding reception on August 8th, 2015. Victoria was always extremely courteous when talking beforehand and always responded quickly to any questions or changes I had. The rate was also very affordable and budget friendly. When I got to my reception, everything was set up perfectly and they were very polite and helpful during the entire reception and cleaned up in a very timely manner. I would definitely recommend Main Event Mobile Bartending LLC for any event you have in mind! Thank you so much for all of your help! We used the help of Main Event Mobile Bartending LLC for our daughter's end of May wedding. We had prepared the food ourselves and needed assistance in serving the food and drinks. Victoria was great to work with as we were planning what we needed and was always very prompt with a reply to my questions. The team arrived promptly and carried out this huge task with much professionalism. We could definitely recommend them to help you with your event, large or small! Very professional, on time and very nice personality. Provided all she had promised including a signature drink for the party with a flowing fountain. Service was prompt which kept everyone with drink in hand. Interesting that normally you have to ask the bartender to put more alcohol in your drink but several of the guests had to ask for less or more mixer. Victoria of Main Event Bartending was absolutely outstanding!! She was on time, friendly, funny, and very patient. I'm counting on her for all my future bartending needs. I know she'll be hearing from many of my guest because they keep asking me about her. Thanks for making my party a huge success!!! Awww thank you so much, your house was decorated so scary beautiful. I had a blast at your 70's Halloween party and would love to work with you and any of your guest anytime. Mobile Bartending really came through for me on my special day. It was about 2 weeks before my wedding and they contacted me rapidly and did everything needed to ensure the bartending was covered for my wedding. And most importantly they are VERY VERY responsible!Although I didn't have a drink of my own everyone that did said they were great! Thanks so much Victoria and Staff!!! I appreciated all of the services that MEMB, LLC was able to offer and perform at such a reasonable rate and professional level of excellence! Their team made a world of a difference for my wedding. I am sure to use them again for future events! Professional team with over 10 plus years of bartending and serving experience. Request our menus for catering. We are a party planners dream. We are a one stop shop for everything you might need to cater or plan your next event. We offer catering service with or without servers. We specialize in breakfast, lunch and dinner for any type of event. Have a function that is already catered, but have no one to serve, we can take care of that. 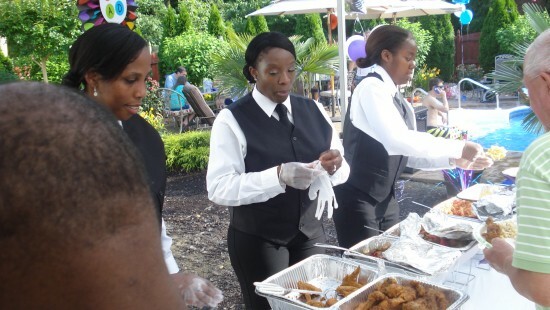 We offer wait staff services that come out and help set up before the event begins, stand behind the buffet line and serve, or serve plated meals. We also help with the clean up of the facility that is being rented. Lastly we do offer bartending. From cocktails for a wedding, or adult party to mock tails for a sweet sixteen party, we can cater it all. Our bartenders are TIP certified and very professional. Don't know what to purchase for your event, we do offer alcohol packages that range from everything for your party needs. We can create signature drinks unique to your event, just tell us what you have in mind. Please look for us at your local bridal shows where you can have a chance to meet us and see a little of what we have to offer? If you would like to just hire us for our wait staff services, please let us know if you would need for us to provide beverages as well. All bartenders have worked either in a club, private , restuarant or banquet setting, giving them the experience they need to work any function.. Our servers have worked in a restaurant and banquet setting.